This is the first Brotherhood of Evil Mutants and classic X-Men enemy. 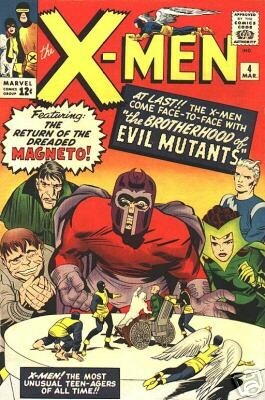 The Brotherhood that started it all it was lead by the X-Men's most hated enemy, Magneto. They fought the X-Men more than any other Brotherhood and in classic Brotherhood style, they lost every battle. Magneto had trouble keeping his goody goody children evil and when he left so did they. After Magneto and Toad came back from their space adventure they got Quicksilver and Scarlet Witch back but forgot to invite Mastermind back to the party. Either way the X-Men and Avengers beat the regrouped Brotherhood and it was revived with Mastermind, Blob, and Unus in it now. Magneto dumped Toad and took lead with this new Brotherhood till they were defeated by the Defenders and turned into infants ending the first chapter in Brotherhood history. While years wise they seem the longest actually they were off and on again during those years having their longest run in 10 straight issues in the beginning.